The term welding can be related to a variety of different processes available in the form of varied brands, models and types of welders used. Thus it becomes difficult to choose an ideal MIG welder for your welding tasks to be performed at home or in your workshop. One needs to identify their preferences and requirements for a welding machine as you may not be able to find one MIG welder that could do all the tasks in the world related to welding. Each different model and type of MIG welder has some specific features and choosing a right welder would be only possible if you know what features you need in your welder. Some of the basic features that one must look for in a MIG welder are related to longevity of the tool, easy to use structure and safe use. Here we have gathered some of the impressive features of the best MIG welder that gives you versatility and convenience of use with user-safety. Smooth and high quality operation of a MIG welder hugely depends upon having a well-built transformer inside its construction. A heavy duty transformer would work well for years and in varied weather conditions in comparison to an ordinary one. Not all but the best ones would have a durable drive system such as cast aluminum. Apart from this construction should be easy and quick to set up. If you wish to enjoy more flexibility for welding jobs related to different diameter wires, a dual groove quick changing drive roll system would be an ideal choice. It doesn’t only makes the system versatile but makes way for smooth feeding. The motor should be tested for reliable performance over years so that you can enjoy worry-free extended life of your MIG welder with proper maintenance. Many of the high-end models and brands of MIG welder include mechanical/solid state contractor that takes responsibility of keeping gun electrically cold until the trigger for a gun is pulled by the user. Having a good wire braking system is important in order to have correct tension for a wire that prevents from any irregular feeding, tangling and spooling. Not all MIG welders include this feature and you must give preference to a machine with this feature. With thermal overload protection, the welder cuts output power to torch or gun automatically if for instance internal circuitry or system is overheating. Such machines have internal fans or cooling systems that are responsible for dispersion of heat as it builds up in a machine that is left powered on. MIG welders also include protection for contact tip. This feature automatically turns the output power off if contact tip is short circuited. This prevents from any damage and give you prolonged life for contact tip. Many of the welders include faster polarity changeovers and thus you can easily switch between differed wires. Some of the welders may need you to rewire the system for use. 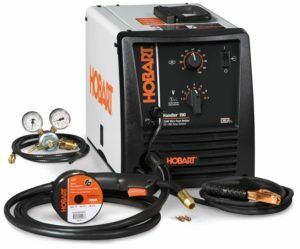 In comparison to other welders such as TIG welder, a MIG welder is more portable. So if you would need to perform a welding job other than your workshop or at home, you would need a space to move on with new happiness. Requirements of amperage vary with the type of welding task you need to perform. It hugely depends upon the thickness of weld and by keeping that factor in mind; you should select a MIG welder that falls well under your requirements. 90 amps – 2 mm. 130 amps – 3 mm. 150 amps – 4 mm. 180 amps – 5 mm. In order to carry out various welding tasks appropriately, you should opt for a MIG welder that is easy to use. The gun/wand and other parts must be easy to setup and operate. Too huge a structure would not be easy to handle so make sure you get something best yet simple to use. MIG welders are expensive equipment and thus you would not be buying a new one each time a problem arise. It is best to prefer a welder with extended years of warranty so in case of any wear/tear, repair or replacement problem, you don’t need to spend more money. Having manufacturer’s warranty gives you worry-free use over extended time frame of years. MIG welders are useful equipment provided you have the right choice for the kind of work load you will be using this tool for. You should opt for a tool that has amperage according to your requirement and that offers you convenience of use with varied other features that you desire. Depending upon your applications and frequency of usage, you should find an appropriate tool so that you will be able to carry out all your welding tasks without any worries and with ease for years.